Guide to Kemberton Church. Click here to download a copy (Word Document 106Kbs). This includes information not found on this website. 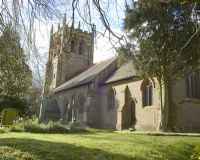 The church is set on high ground with views of the Wrekin in the west and the Clees in the south. Its position makes access difficult except by sand stone steps. There may have been a church on this site since Saxon times, and the present building is thought to be the sixth or seventh structure.We know that in 1230 one Gilbert is recorded as chaplain. One of the church buildings was taken down in 1780 and fragments of a 13th century church structure were found. More recently, in the building of the present church in the 1880's, medieval tiles were unearthed. Copies of two of them, a man blowing a hunting horn and a stag and dogs, have been incorporated in the floor of chancel and nave.The present tower was built rather later than the rest of the of the building, and was only finished in 1910. A local man, Joseph Farmer, was the architect for it all and we know he disdained the local sandstone - though plentiful - and had stone brought from Cosford by horse and cart. Before this tower, there was a round brick tower and Georgian interior, complete with gallery. There are two touching memorials in the church. One is at the East end of the nave, where a table bears memorial books of those who lost their lives in the two world wars, one of whom was the son of the Rector. In the Baptistery (under the tower) is a more recent addition: a tapestry made at the time of the centenary celebrations in the village in 1989. The tapestry is made from squares each representing a separate household or trade in the village.